The order of elements in more complex diffs is not consistent with the order of elements in the formal datamodel as specified in https://www.mediawiki.org/wiki/Extension:WikibaseLexeme/Data_Model. This is visible when comparing two revisions with lots of edits in between, or when comparing two revisions from two different Lexemes. 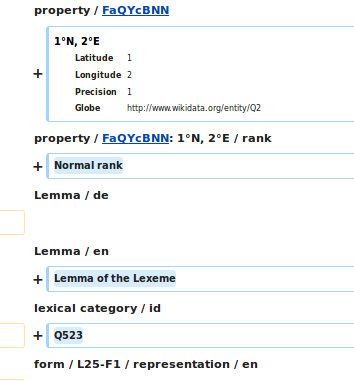 The Lexemes statements are first, followed by "Lemma" and "lexical category". It should be the other way around, statements last. 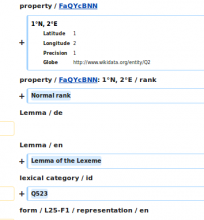 thiemowmde added a subtask: T185477: [Bug] Lexeme diffs fail because of incomplete Form diffing [M]. Tarrow added a project: Wikidata-Editor-Experience-Improvements-Iteration7.